Last weekend was the Mill Road Winter Fair, one of my neighbourhood’s social highlights. It was already packed as I headed to my mid-morning zumba class (like I was going to miss out on Gangnam style! Honey, please); it was busier on my way home; and by the time Ian and I made it to the food fair, the whole street was bumping, despite the fact that it was the first day of a pretty serious cold snap. Ian and I saw belly dancers, a Chinese dragon, and a ten-year-old playing a surprisingly good version of “Wild Thing.” We sampled some mulled cider; bought some potato bread and rice pudding; and crammed our face full of pizza and sausages. The sausages from the butcher on the corner were a highlight last year, so I was pretty psyched to see them again. Literally everyone, up and down Mill Road and on many of the street branching off, was out in force. It was a lovely afternoon. Because my doorknockers of Cambridge post was such a smash hit (biggest day yet! 20 likes! thanks, y’all! ), I’m going to do my best to make it a series – weekly when possible, but every other week at least. I’m going to try to find some recurring architecture detail around the city and post a bunch of photos. I’m not sure how long I can keep it going, so I’m eagerly soliciting suggestions. What do you want to know about Cambridge? This is the view from immediately in front of my house. I met someone recently who described my neighborhood as “gritty,” which I guess it is a little bit. But I love it. And one of the first things I noticed as we were getting settled in is, when your front door is inches from every passerby’s face, doorknockers become an important means of home decor. The doorknockers in my neighborhood are amazing. In a twenty-minute walk yesterday, I counted 38 distinct ones. Mill Road Cemetery is one of my favorite parts of my neighborhood (see below), but there is a whole lot of stuff about my ‘hood that I find pretty delightful. Mill Road is the miscellaneously ethnic area of Cambridge – two North African restaurants, an art gallery, three coffee shops, Korean, Chinese, Japanese, Middle Eastern, and hippie/yuppy whole foods grocery stores, bike shops, two curry houses and a Korean restaurant…its exhausting. And awesome. 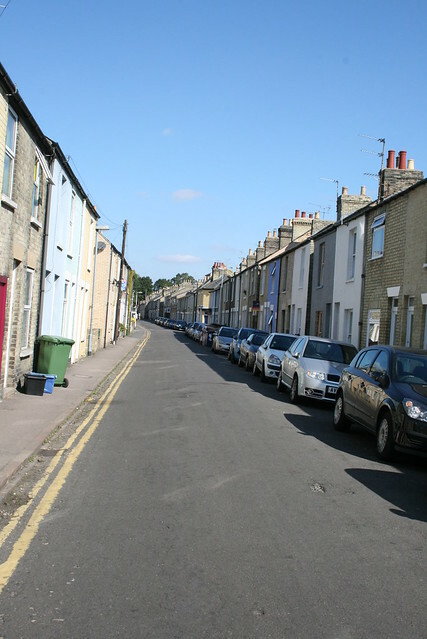 The area just off of Mill Road, where I live, is quiet; lots of young families squeezed in modernized terrace houses on very narrow streets. A surprising number of local businesses occupy the first floor of a terrace house (my favorite is a violin/cello/viola/etc bow maker who looks like Santa Claus and has a workshop on Kingston St. Unfortunately I don’t have a photo of him). Stay tuned for pictures of Mill Road and of downtown Cambridge, which is pretty sweet too. One of the hidden gems of my neighborhood is the Mill Road Cemetery. Most of the graves are from the mid- or late-19th century, when the area was just being developed. 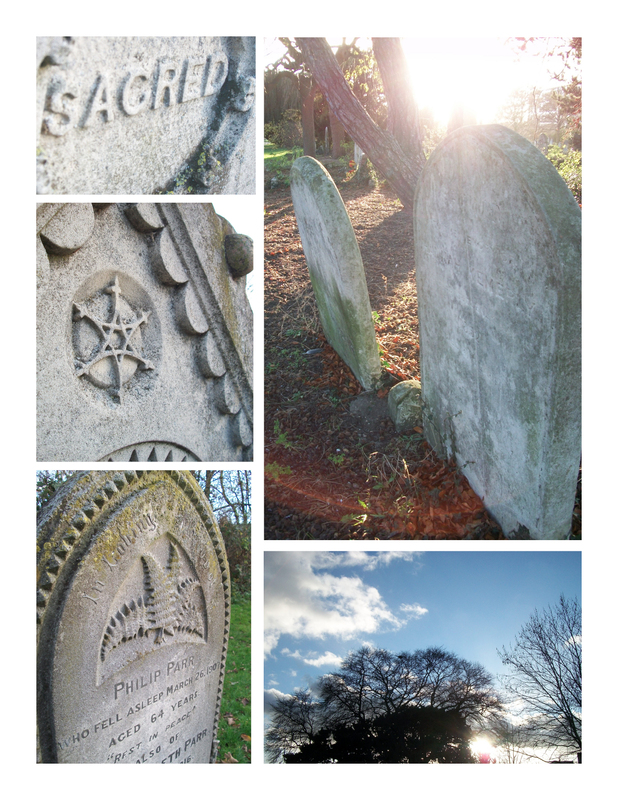 The cemetery as an old-timey and ramshackle feel, and is also always (paradoxically) full of life – most of Cambridge is so dense that there isn’t much space for trees, but the cemetery has plenty, plus birds and squirrels and people walking dogs. As part of the Mill Road festival this weekend, the Friends of the Cemetery group gave free tours, which naturally I took. I learned all sorts of really cool stuff about iconography – for example, the resurrection fern featured on one of the headstones is a plant that can appear completely dead but, when watered, will return to health (Sam Beam explains in the video below). There is also a pagan symbol, the green man, made entirely out of leaves or with leaves coming out of its mouth, that can be found on many headstones and in churches (usually hidden, since its pagan) around Britain. 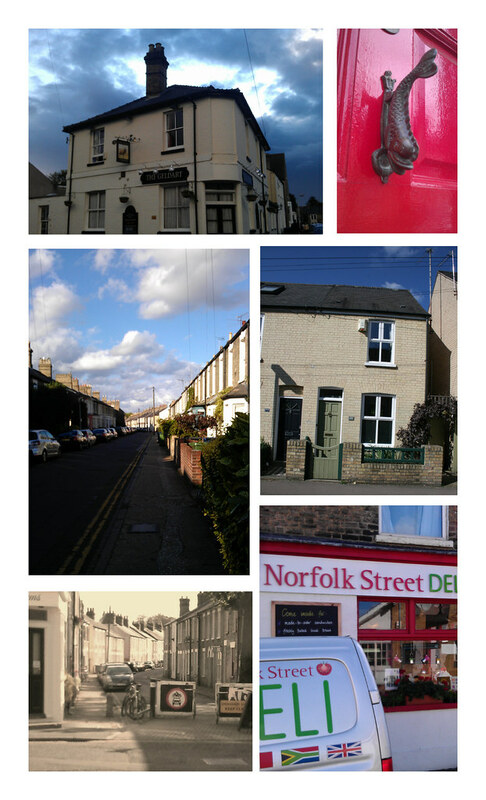 When we first moved here, I detoured through the Mill Road Cemetery often – there’s a cut-through near our house and there’s also a pub, the Cambridge Blue, with an entrance from the cemetery – but I hadn’t been there in a few weeks. On a sunny day, its one of the most beautiful places in Cambridge – which is saying a lot, because Cambridge is a city full of beautiful places.